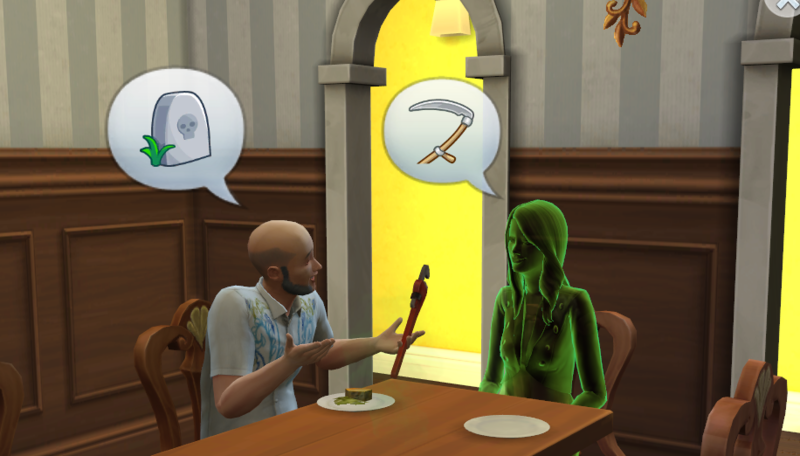 Spencer finds his soulmate and it’s a wrench; also, he dies. Well, the ghosts have been fun. Takeo has been rather cranky when he visits, though, and has taken to breaking most of the plumbing when he visits. Awesome. Meilin showed up, too. She and Spencer had a nice chat in the middle of the night (he was hungry). I edited the town a bit because of reasons. Added some #LegacyLovers to the town. Didn’t really look at them too much; I didn’t want to spoil anything. I decided to send Ryu out to meet some ladies. He did some browsing and finally found a gal named Maggie Summers. She was really cute and her party dress was adorable. He got on with her best out of all the ladies he was talking to. Their romance was pretty high by the end of the evening so I did a daring thing: I had him propose. She denied him. Not wanting a repeat of Meilin, I sent him home to nurse his embarrassment. The next day I had her come by and she was in a better mood. 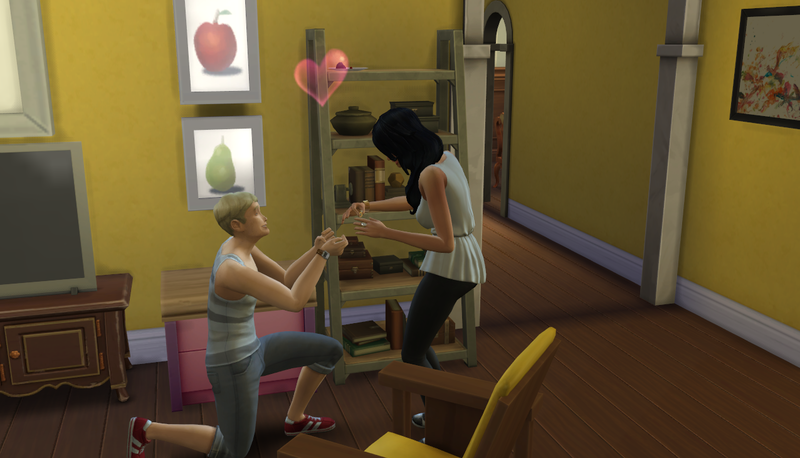 They had a little woohoo and he proposed again. 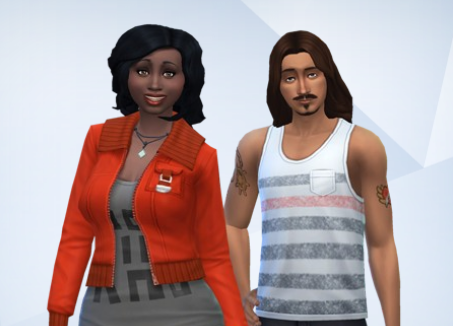 This time she accepted and they eloped. Now we’ve got Miss Maggie in the house – score! Isn’t that hilarious? 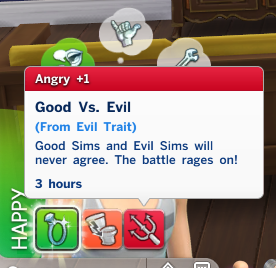 HOWEVER, she also gets the sad moodlet when they’re around each other because he’s chosen a life of evil. Poor baby. She also has the family trait so she often wants to see her little sister, Marisa Melisa (who is still a child). I’ve considered moving her sister in, too, but I don’t really feel like it. I’m feeling more mean. 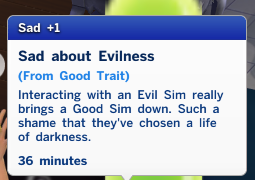 OH, in current heir news, Rei completed her aspiration!!!! I was so happy for her! 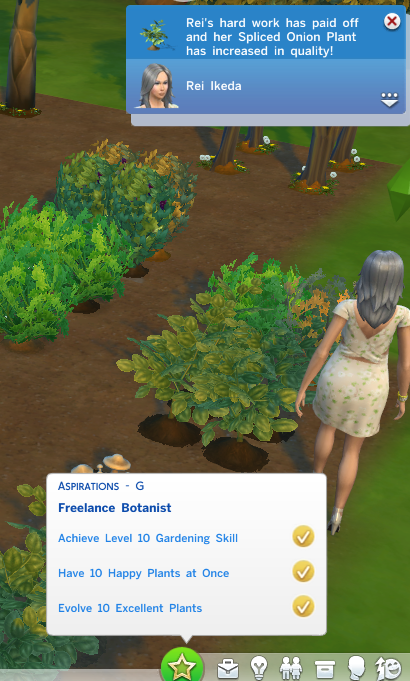 I really hope the family can keep the garden going. It is an excellent source of income. I had gathered a ton of money and finally was able to buy Kaida a grand piano. 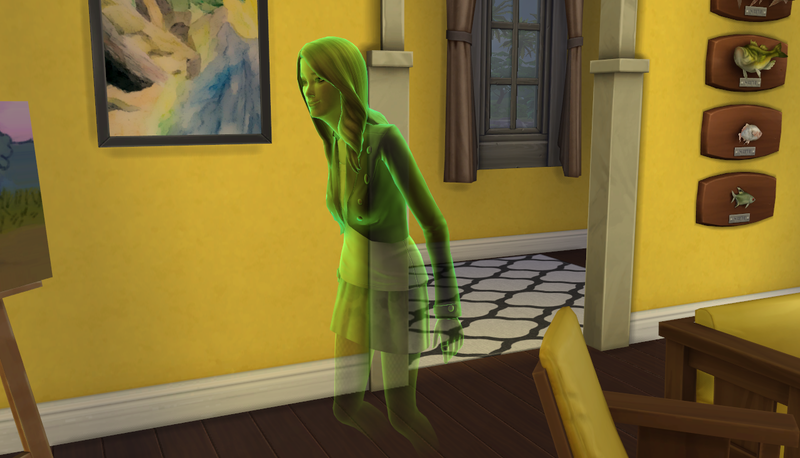 It returns to the house after four generations when Misaki had to sell hers. The family certainly has moved up. 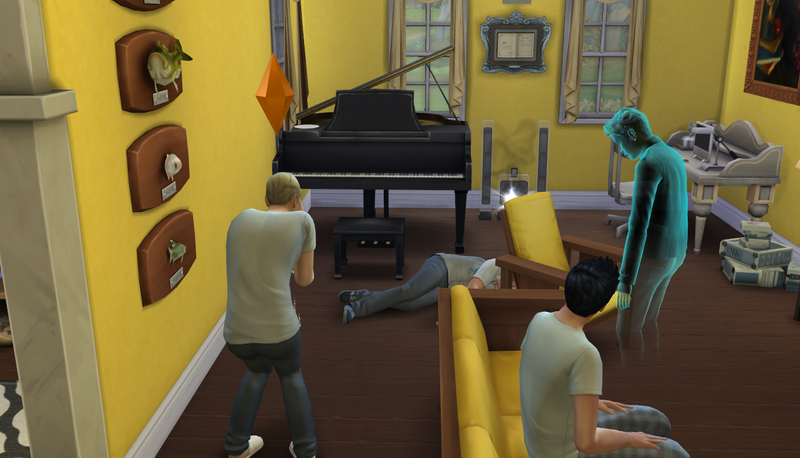 Cory, Reina’s youngest, decided to move in with his mother but it was at this point I realized Reina had died so he moved in with his sister instead. He has cousins he could have moved in with but a sister is preferable. Spencer was really getting up there in age. I got the two day warning and then the day-of warning. I figured, hey, they usually wait a little while before kicking the bucket, I’ll let him stay home in retirement for his last days. You’re so weird, Spencer… Enjoy retirement. He was sitting on the couch with Takeo Jung and eating breakfast; he was supposed to start work in an hour. I decided to have him retire. Just after I click the option, everything cancels and “elderly demise” appears. SERIOUSLY? THE MAN CAN’T EVEN ENJOY ONE MINUTE OF RETIREMENT?! Takeo Jung was still visiting at that hour and he watched on and shook his head in sadness. Ryu stood by crying big fat tears. Kaida was still sleeping and Rei, dear wife, was in the bathroom. Neither cared. It might have something to do with the fact they had a full romance bar and ZERO friendship. Sad. 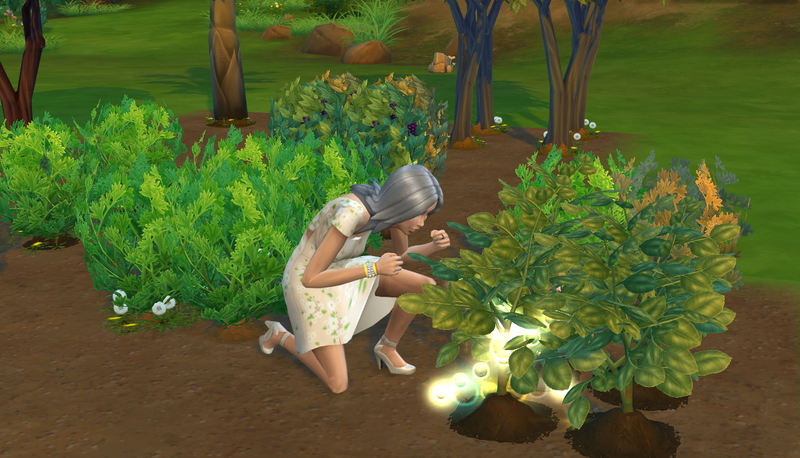 Grimmy took forever to show up and he actually got stuck between the trash plant and the workbench. I had to reset Spencer. 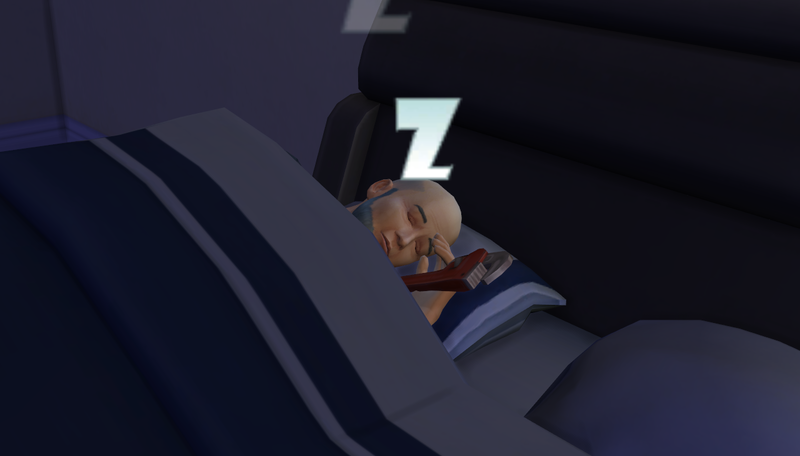 He was still dead, in case you were wondering. Grimmy stood in front of the tv for a while after that and then disappeared. It was a strange morning. Right after that, Rei got her final days notice (her second, if you’re keeping score). 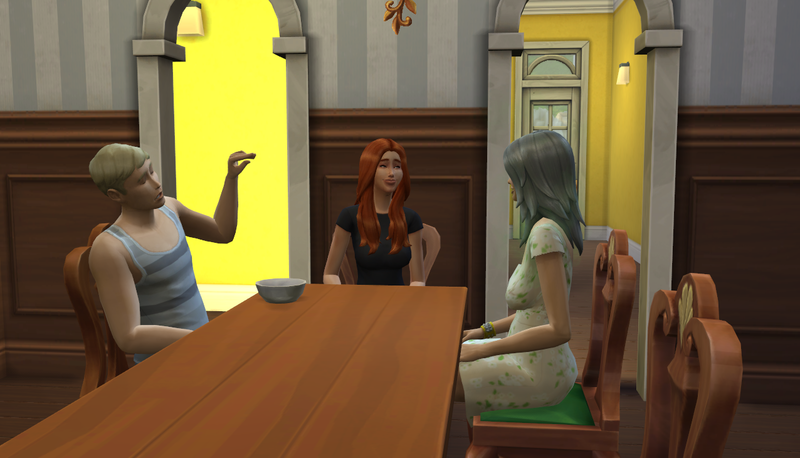 I took a moment to check out her relationship with her kids and… OH CRAP, both were at zero! I had to fix this. I had her have a chat at the dining room table with the two of them. I hardly encouraged them and by the end of their chat Ryu was in the lead. That’s how it was before so I don’t think I really interfered.